o The monk’s hood is too wide. o The monk’s face/hood is too blurry in a larger version. Shadow is fine, but blurriness is not. o The water should be more realistic–it’s missing white caps on the waves, etc. o Turn the ‘L’ in Caldarian and the “o” in Conflict into a noose. I might try a little stronger shadow for the text, but the art itself is solid. The water should be darker with more whitecaps and waves. Other than that, I really like it!!! Good job Mike!!! I really like the water and boat. The person in front has a really wide hood (looks like he has a ton of hair maybe?) and there is something weird with the top and left of his head. I think it could be that he is in shadow, but it looks very blurry. Also, I like the font for the text but it doesn’t look quite right. I’m not sure if it needs a bigger shadow or a thin outline? Maybe it could have some gradient to give it a more 3d look? Honestly I am not sure the solution. Overall it looks good. Great feedback, Grady! Much appreciated. LOVE the type font! The monk still looks more lumpy than contemplative to me. Yeah, I agree. The hood really needs to be slimmed down. I’ll definitely let the artist know. I’m really picky because I used to teach layout and design and typography, so please bear with me. I agree with Grady on some of the things – the monk’s hood should be smaller, ending where you see a line on the hood. That would require a l…ittle repositioning of the monk and the ship for balance (move the monk up very slightly and to the right and move the ship down slightly and to the left), but I think it would look better. I agree about the font — it needs an outline or shadow to make it stand out more — I would suggest a black outline on the text — try a 2 pt. outline on the title, and a 1 pt. outline on your name. I also think your first and last name should be kerned together a little – take a little space out between your first and last name and then re-center the text. I think this is awesome, Michael — I’m so excited for you! Very appreciated! This is exactly what I’ve been looking for. Grateful for the details! Shrink your graphics a little and you’ve got it. Or go with smaller fonts on both blocks; move the title up and left a little and make the name go down and right. Just don’t let the words step on the artwork. Also seems to me that even with the slight list, the waterline should be higher on the starboard side. She’s riding awfully high and empty; if they’re pirates, they’re not very good ones. Now having pummeled the details, MAJOR congratulations on getting the Jolly Roger blowing in the correct direction. I’m always amused to the point of hysterics by the sight of a sailing ship with the jack streaming proudly back from the masthead. Thanks a ton for the feedback. Always love to get advice from experts! The text running into the masthead bugged me a little too, and I think you nailed why. And they are riding a bit high, but the intention was that they were headed out for plunder. I think you’re right, though…the water should still be a bit higher on the starboard side. Much appreciated! Hi Mike. I just tried to leave a comment, then lost it all when I clicked to follow the comments. Darn! Basically, I said that I agree with the commenters about the water. At first the water looked like a blanket to me, so adding white caps and darker areas should fix that, plus lowering the water. I love the artwork and it’s appealing. Nice font. Maybe adding a shadow or something to make it pop would be even better. I learned a lot from the comments that were left. I love your back jacket copy. It’s a great hook and sounds like a cool story. Great font, but it should be blurred slightly to more closely match the “fuzzy, painted” look of the rest of the cover. 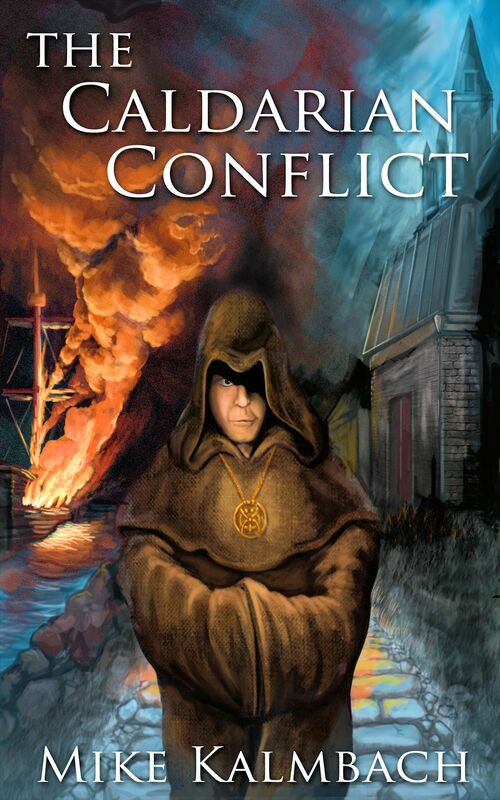 I agree the water needs to be darker w/ whitecaps, and the hood should be lower, with more of the monk’s face in shadow. The back cover text should be a teaser, not a summary. You give away way too much info. It’s also about twice as long as it should be — about 2 paragraphs is plenty for the backpage teaser. After centuries of dealing with pirates ambushing merchants in the Shalladian Sea, the Caldarian navy leadership will do anything to eliminate the problem. Admiral Cain and his ruthless assistant Krell have finally landed on a seemingly perfect solution. Thereâ€™s a catch: if the citizens of Caldaria discover what he’s doing, they will revolt. If the king finds out, Admiral Cain will lose his head. 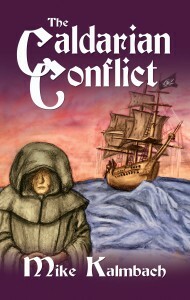 Brother Mendell, a monk dedicated to Lord Justice, is sucked into the battle when he consoles a pirate prisoner sentenced for execution. In his quest for justice, Mendell inadvertently finds himself at the forefront of a war between pirates and the Caldarian navy. Thanks, Curt. Good point. I’ll take a closer look and see if something else should be removed/adjusted with your recommendations. Much appreciated. Anything I might have said about the cover has already been said in the comments above, but I like it. I also like the sound of the story, it is definitely something I would try. My only gripe, and I’m not sure how you fix this (if I was, I’d be applying for a job in publishing), is that the back-of-the-jacket copy could do with a little more “punch.” I read the whole thing because your a twitter friend and, because I read it, I found that it’s a story I’d be interested in, but if I’d picked the book up in a shop, or looked at it on Amazon, I’m not sure I’d have read the whole blurb before moving on. Agreed. The blurb is missing something. I’ll play with it a bit more. Thanks for the feedback! I know its too late but I just stumbled upon this post, aside from what everyone else has said, the pirate flag seemed a bit hard to make out, maybe bigger or more crisp contrast between the black and white?